Al Youla (Yulla: the variety of traditional dances in the GCC demonstrates that the countries possesses a great richness of heritage. 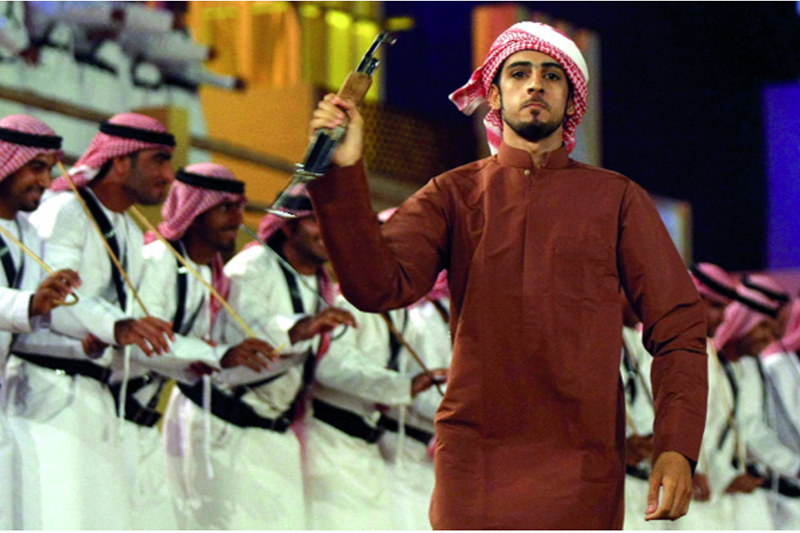 It is the traditional dance in the United Arab Emirates dating back 200 years; youla began in the past as a way to demonstrate men’s strength and flaunt their abilities where they used to twirl the weapons during Al Rrazfa Al Harbiya Al Ayallah (kind of dance). The rapid modernization of the nation does indeed threaten its traditions, but anyone who has witnessed the spontaneous and spirited traditional dances at local gatherings will know that the unique cultural heritage of the Emirates will be preserved by its proud custodians. Al Youla can perform as a solo artist or as a group, Al Youla is performed by one, two or four men focusing on the skills of using Al Youla weapon and moving it rapidly and harmonically by the performer (Al Yaweel) who darts the weapon into the space; the higher the better. and can be mixed with Al Rrazfa, Al Harbiya, Al Ayallah dancers. Successful dance depends on the harmony between Al Youla performance and spin movements of the weapon.